Sophie the Giraffe is marketed as the world’s most famous baby teething toy, so obviously it merits some explanation. Sophie is made of natural rubber and chewable appendages as well as an internal squeaker that makes noise when squeezed to keep your child amused. Sophie fits well in your baby’s small hands and stimulates the senses while soothing your baby’s sore gums. The Organic Fruit Tote by Under the Nile has assorted chewable pieces that your baby can choose from to help soothe their sore gums but also help with their motor skills as they practice grabbing and mouthing the fruits. All of these individual pieces are also machine washable. Rainbow Baby by Kathe Kruse comes in a variety of different colors and is made of ultra-soft cotton and holds a ring made of bees waxed beech wood, which is perfect for teething. The two different textures give the baby a range to explore, while both stimulate senses and promote growth, while easing sore gums. 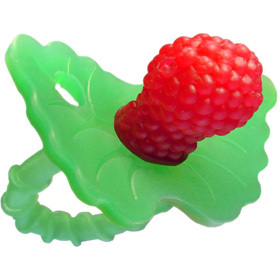 Raz-Berry Teether by Razbaby is especially great for babies that love pacifiers. The teether is designed to look like a raspberry since raspberries have little bumps and apparently feel great on aching gums. This teether is made of flexible 100% medical grade silicone.